Dr. Jayaram joined SMOC in August 2011. He is board certified in oncology and hematology. 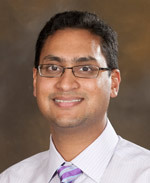 Dr. Jayaram completed his internal medicine residency and hematology/oncology fellowship at Indiana University School of Medicine in Indianapolis, Indiana. He received his medical degree from St. George’s University School of Medicine in St. George’s, Grenada. He holds a Bachelor of Pharmacy degree from Butler University in Indianapolis, Indiana. SMOC is excited to have Dr. Jayaram as a full-time physician at our Jacksonville office. Residency/Fellowship Research Assistant with Professor Asok C.Antony and Prof. H.N. Jayaram, Indiana University School of Medicine, Department of Hematology and Oncology, Indianapolis, IN. Work involved constructing folate-tethered and non-targeted liposomes containing Tiazofurin. liposomes then tested in HD29 and Caco-2 colon cancer cell lines expressing folate receptors. Cytotoxicity studies currently ongoing. Research with Professor Nasser Hanna, Indiana University School of Medicine, Department of Hematology and Oncology, Indianapolis, IN., involving treatment of extensive Small Cell Lung Cancer. This involved development of a protocol for a randomized, phase II study with Cisplatin plus Etoposide with/without concurrent ZD6474, a novel tyrosine kinase and angiogenesis inhibitor, in patients with previously untreated extensive stage SCLC. Study has funding and protocol is currently pending IRB approval. Research Assistant with Prof. Arun Srivastava, Department of Microbiology and Immunology, Indiana University School of Medicine, Indianapolis, IN. Helped in research involving adeno-associated viruses in order to increase the efficiency of gene transfer. Biochemistry and Molecular Biology. Research involved elucidation of the mechanism of action of a new anticancer compound, Benzamide Riboside. This work culminated in Co-authorship in a publication. Research Assistant with Prof. George Weber, Director, Experimental Oncology Laboratory, Indiana University School of Medicine, Indianapolis, IN. Work involved the determination of effect of Tiazofurin, a recent anticancer agent, on IMP dehydrogenase in hepatoma cells. Winner ASCO 2010 Merit Award for above poster presentation. March 2008 Winner Best Chairman’s Rounds presentation titled “Erythrocytosis and Polycythemia,” given March 2008. 2005 Winner State ACP Abstract competition, 4th place, 2005 for abstract titled “Persistent hiccups as the initial presentation of metastatic colorectal adenocarcinoma” and was given opportunity to present poster at 2005 Indiana Chapter ACP meeting. imaging on outcomes in patients with stage III non-small cell lung cancer (NSCLC) treated with chemoradiation: A subset analysis of HOG LUN 01-24/USO-023. J Clin Oncol 28:7s, 2010 (suppl; abstr 7065), submitted to J Thor Oncol for brief report publication June 2011. – Married to Smitha Jayaram, together they have a daughter Aneesha and son Tejas.